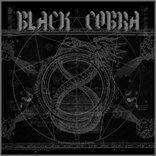 BLACK COBRA was formed by two sludge scene stalwarts whose pedigree includes such seminal bands as -16- and CAVITY. That right there should tell you everything you need to know. Sans a bass guitar, BLACK COBRA creates a bulwark of mid-paced doom sludge that sounds like a tortured soul crying for penance while lost somewhere between Hades and the river Styx. For sound references look no further than the aforementioned -16- and CAVITY. If that doesn't whet your appetite, then you aren't going to like this CD anyway.